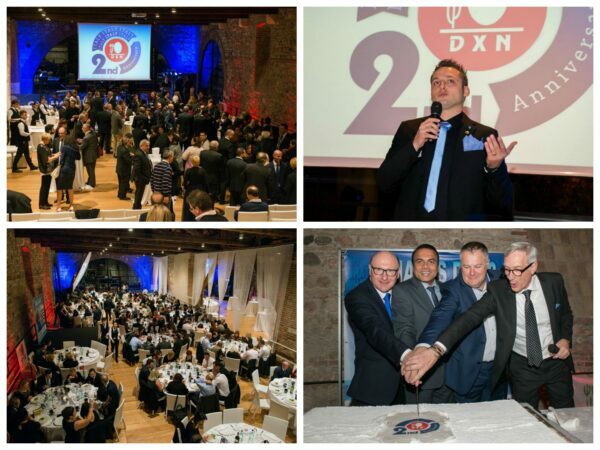 On November 28, 2015 DXN Italy celebrated its 2nd anniversary in the stunning location of the Dogana Veneta on Lake Garda. Members from all parts of Italy came together to enjoy the gala dinner, the party and of course the speeches of the Marketing Team of DXN, DXN Italy office, the first and biggest European leader, and successful Italian leaders. The celebration started with an Italian aperitivo: drinks and delicious fingerfood. Mr. Giuseppe Girlando, DXN Italy’s Country Manager took the stage to welcome the guests and to introduce the Italian leaders. We are so happy about that, that our DXN Diamond Manuel Longo had a speech too. You can watch his speech, what he held on the IV. European Leadership Camp in Barcelona with English translation. Mr. Jijith, the International DXN Marketing Director announced exciting news for 2016: Car Incentive Program for the Italian DXN members and TSIP 2017 in Dubai. Then the gala dinner started and they all enjoyed a traditional Italian risotto and a salmon filet with excellent wines from the region. During dinner there were speeches. The next attraction was the huge millefoglie cake: it was cut by the main managers. After the cake they gave personally the pins to the recently qualified Italian DXN members. It’s very special to be the part of this huge internation DXN Family. We could have very special moments together.